Carson Park sits on an island (really a peninsula) surrounded by Halfmoon Lake. 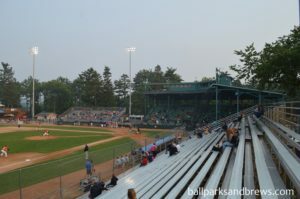 Built between 1936-1937 as a WPA Project the grandstand is constructed from sandstone that was quarried from Downsville, WI, a small town about 25 miles away from Eau Claire. Taking in a game at Carson Park is like taking a step back in time. Henry Aaron made his professional debut at Carson Park in 1952 and this is symbolized with a statue of an 18 year old Henry Aaron in front of the park. 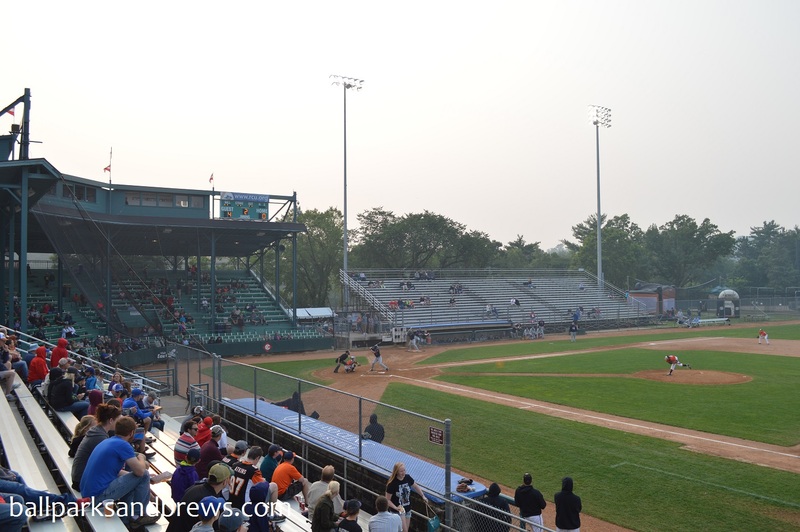 Once inside the ballpark there is a small concourse with low ceilings where you will find some concession stands along with the some memorabilia from previous Eau Claire teams. The grandstand has not changed much since it was built in the 30’s and that is a good thing. There is the occasional beam in the way but you are able to easily move seats so the only thing in the way of your view is the protective netting (and chain link fence for parts of the park). There is also bleacher seating down each baseline for additional seating options. 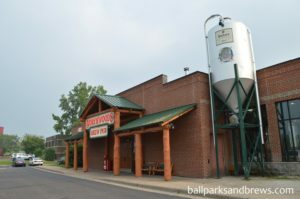 Best Spot for Beer: The Rail Yard Tap Room greets you as you enter the ballpark and has a few limited craft options. This will be the best bet for most people. However, the Fan Deck in the right field corner also has a couple craft options including Saint Francis Brewing Co. and Samuel Adams options. 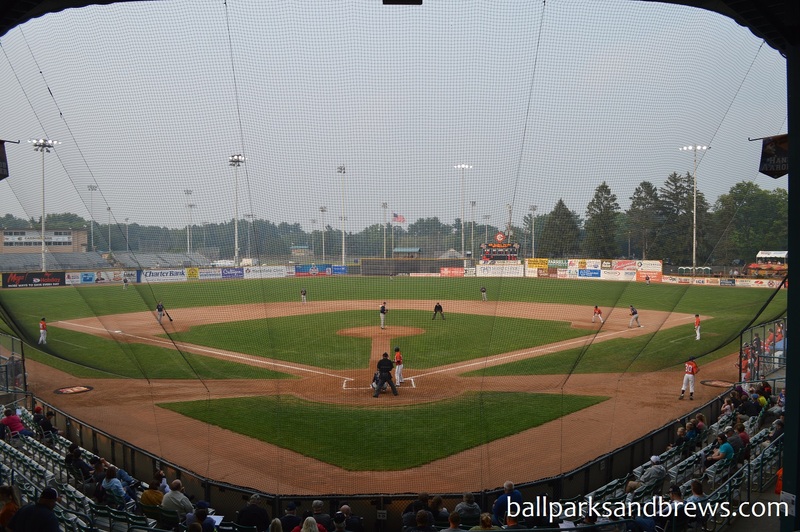 There aren’t many ballparks like Carson Park left. Many of the old WPA parks have been torn down or gone through so many renovations that you can’t tell what’s left of the original park. 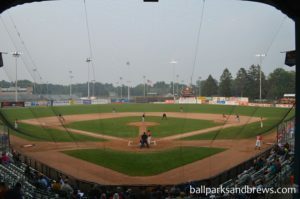 Luckily, the city of Eau Claire has left Carson Park mostly alone and this creates a unique environment to watch a game. 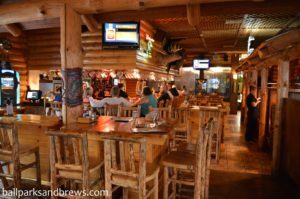 Brew Basics: A pub that feels like a neighborhood hunting lodge with a good chef and a decent beer list. This place was unlike any brewery we’d ever been to. Some might call the deep woods cabin theme over the top, but seeing as it really is in the Northwoods part of the US, we just felt like we were in an amazing time warp. Like the difference between visiting a theme ranch in Florida, where it’s kitschy, vs. in Texas, where it’s actually a thing. 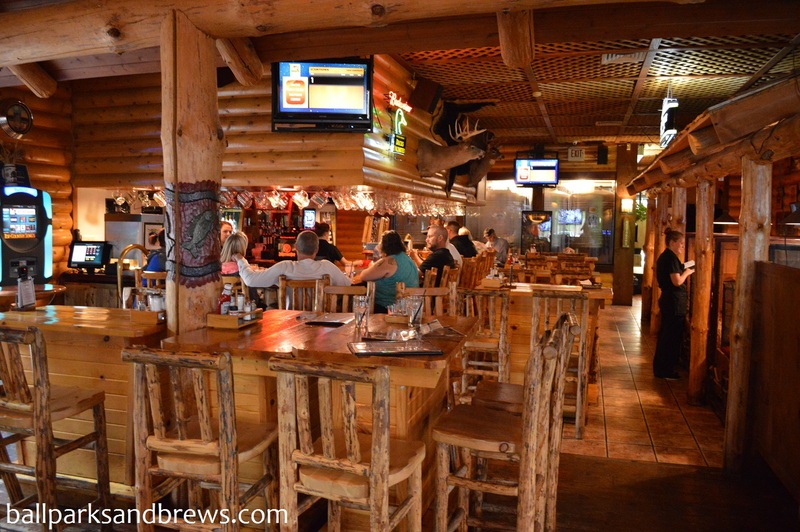 Northwoods is a huge log cabin with a large stone fireplace. 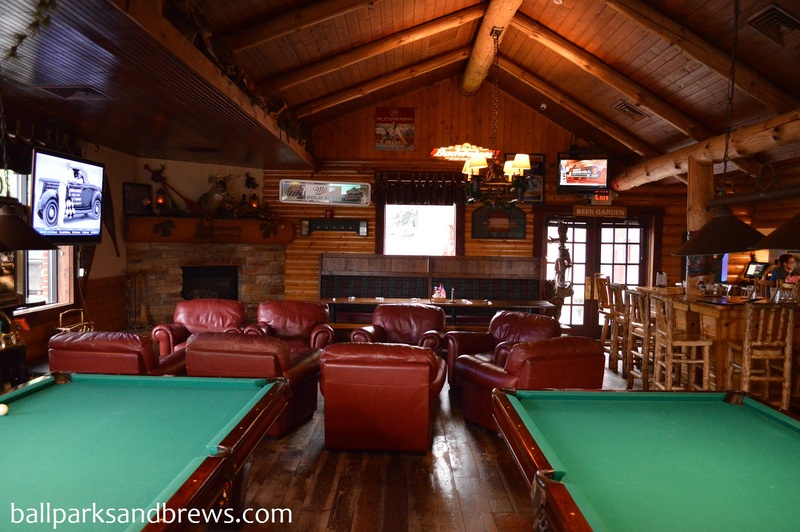 They’ve used a good portion of their restaurant to make the locals a home away from home with over-sized comfy chairs in key proximity to the fire, a pool table, a couple of games and lots of hangout space. Between the lacquered, hand-carved wooden tables and chairs and the wood carvings etched in the pillars around the restaurant and various deer themed decor, you feel like you’re in someone’s hunting lodge – and like it should be snowing – even in July. 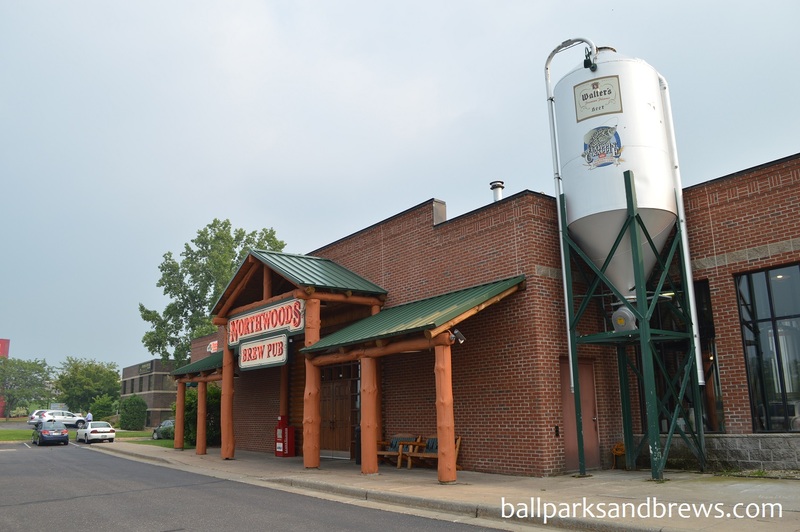 Northwoods has a seemingly popular mug club, which ranged in price from fairly reasonable to $250 for a year – but that option came with the chance to brew your own beer in their facilities. They had a flight, and while the options were selected for you, we were able to switch out two. Bumblin’Bubbas Buzzn’ Brew. Very light yellow and clear. Light lacing and smells light with a touch of honeyed sweetness and the taste is exactly that as well. Our server reported that the Buzzn’ was local favorite. Floppin’ Crappie – This was a pretty, maple color and smelled of caramel hops. A refreshing but plain malt ale, with caramel finish. Rowdy Rye – So pale yellow and hazy, it looked liked a hefeweizen; but you know from the first taste that the beer is not mislabeled. All rye, all day. Crisp and dry with a clean finish. Red Cedar – Not surprisingly the Red Cedar is a red ale, that actually pours fairly brownish in color. It smells carmelly and even more so imperially sweet which carries over into the flavor of this sweet tasting ale. Lil’ Bandit Brown – Has a rich brown color and foamy head. After the ones before this beer was lighter on the palate than expected but the finish was fairly malted. A back-loaded beer with a good malt aroma. Wall-IPA – Light and gold and smells of floral hops. When the flight arrived, the beers were jumbled together and we had to discern which was which. Once like this easily identifiable IPA made the task simple. Wall-IPA proved to be a hop beer with tangy hop finish that was a puckery kind of tart. Poplar Porter – Ivory foam head on this ruby colored beer. Nutty, sweet aroma and good taste. Another back ended beer with roasted malts and a nutty, almond finish. Kelly’s Stout – Deep currant/coffee brown color that smelled like root beer and had just a bit of lacing. Flavor that starts light, builds with sassafras notes in the middle and then ends with a watery finish. A very thin stout.